Look below for GCBA church activities, upcoming mission opportunities, and on going meetings. If you see something that is not listed that should be, please email Preston Thompson, DOM, at grandcrossings@gmail.com. The National Day of Prayer will be May 2nd. Please click on the link below for resources for your church. May 19th through 26th, 2019 is Association Emphasis Week for GCBA. Provided below is the bulletin insert with information about GCBA. If your church needs for these to be printed off for you, please contact Preston and indicate how many you need. Also for this year, we have offering envelopes for each church to hand out to their membership or place in their pewbacks. Please let Preston know how many you need for your church. The next GCBA Executive Board Meeting will be May 21st at FBC Fulton @ 6:45pm. It is very important for each church to send their representatives to this meeting as we will be discussing the feasibility of a merger with the Mid Missouri Baptist Association (formally Little Bonne Femme Baptist Association). More information will be mailed out to each church about this possible merger and the decisions that will need to be made at the EB meeting. If you are not sure about whom from your church is an Executive Board Member please click the link Executive Board for more information. If you have any questions, please contact Preston. 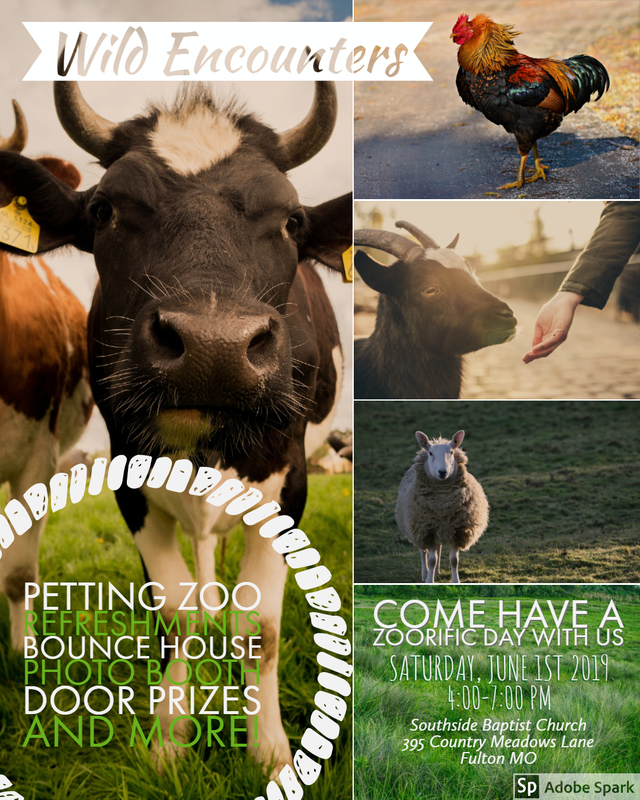 Southside Fulton is hosting a VBS Promotion event on June 1st. The event information is found below and the flyer is attached. 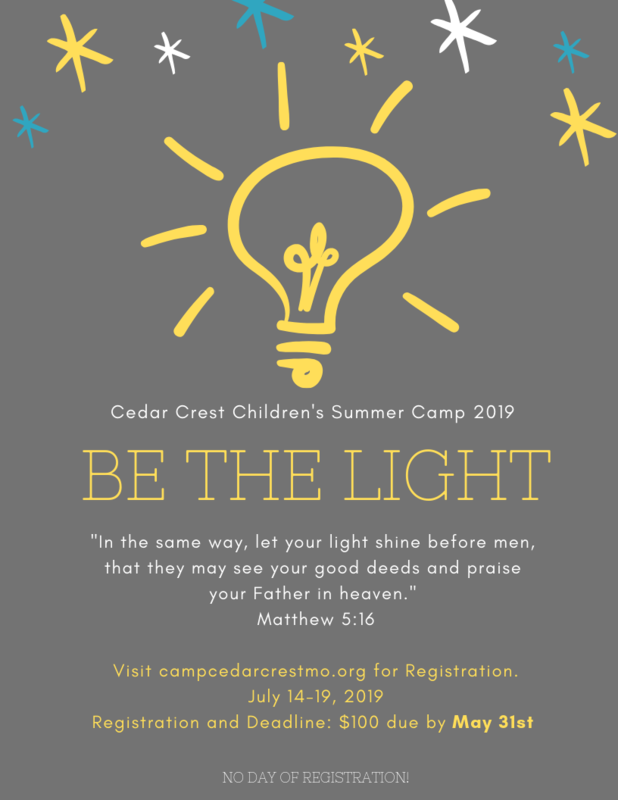 Below you will find the flyers for this summers youth camp at Camp Cedar Crest. There are three different flyers (full sized, half sheet, and black and white). If you have any questions, please contact Jason Glenn at the information provided on the flyers. 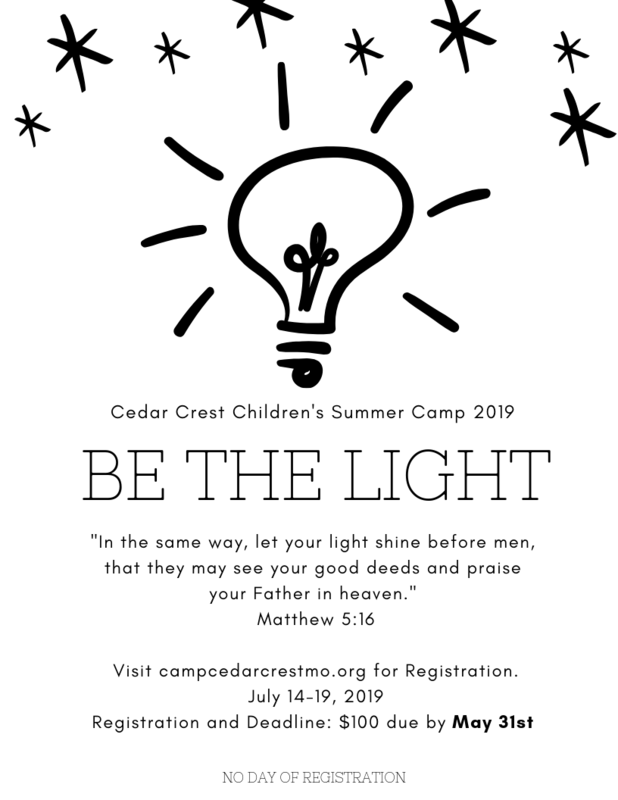 Below you can find the flyers for Children's Camp. We have provided both a color and a black and white option for your church. If you have any questions, please feel free to contact Monica or Preston at the information provided. The Church in North America is the primary source for funding and sending missionaries, so the spiritual health of North America impacts mission work around the globe. The North American Mission Board sees a mission field that needs the hope of the gospel. With your partnership, we are all committed to taking this hope to cities, small towns and college campuses. Your prayers and gifts to the Annie Armstrong Easter Offering® provide support for more than 5,000 missionaries. These men and women are planting new churches in unreached communities and meeting needs through compassion ministries. Every day, lives are being impacted and transformed. Please be in prayer for how your church can be a part of this offering. Challenge your church not just to meet the goal you have set but that you would succeed. And together we will do this for the glory of God! Check out these resources for a better understanding of CP and how your church can be a part of it. The Camp Cedar Crest Board would like for pastors to know about their new Pastor Retreat room at the campground. Every Monday, Preston, sends out an announcement email to a whole mass of people. If you would like to know what is going on in the Association and important dates to know, send him an email at DOM of GCBA, and he will add you to the email list. The first Tuesday of each month all pastors are encouraged to meet together for lunch at 12pm. This is a time of fellowship with other brothers who are also in the trenches of ministry. It is not designed as a program or with much structure. The location changes each month and is decided by the pastors in attendance at the previous months gathering. Carpool is always the best for fellowship and cost effectiveness.